Average Height	: 26" - 32"
Average Weight	: 60 - 105 lbs. National Borzoi Rescue Foundation, Inc.
Few dogs are as stunningly beautiful to the eye as the Borzoi, and doubly eye-catching when paired together. This is a dog that moves like their floating above ground when in full stride ~ is also a powerful breed, aggressive and purposeful. Bred to bring down wolves, they have deadly accuracy and bred to kill. This is not a breed to turn loose around any other dogs. The Borzoi’s roots began with the Arabian Greyhounds, gazelle-coursing dogs of great speed that where imported into Russia by dog lovers that were welcome in Royal circles. When these breeds failed to survive in the Russian climates more were imported and bred with Russian working dogs. The result….the Borzoi we know today. Once known as the Russian Wolfhound, the Borzoi's dates back to 1650, when the breed was first written about in his homeland, Russia. Bred for hundreds of years by Russian royalty, the Borzoi is believed to have been developed from the early Russian Bearhound, the coursing hounds of the Tatars, and the Owtchar, a tall sheepdog. The hunts that the Royalty embarked upon were quite spectacular. They would involve hundreds of Borzoi, hunted in trios of one female and two males, as well as an equal number of foxhounds. The foxhounds were used to seek and flush out the prey (wolf) whereupon the huntsmen released their Borzois to run down and hold the wolf. Many hunts resulted in the Borzois killing the wolf, but it is also documented that Borzois also pinned the wolf until their Masters arrived who then bound and gagged the wolf, often setting the wolf free to be hunted again another day. These lavish hunting expeditions were common until 1861, when the serfs, who made up a large part of the hunting groups, were emancipated and the nobles could no longer rely on an unlimited work force. By 1873, the Borzoi Breed had nearly become extinct, which alarmed those who loved the breed and efforts were launched to rescue the few remaining Borzois by creating an Imperial Association to protect and promote the breed's bloodlines, standards and characteristics. Today many Borzoi in America can be traced to the dogs from the kennels of Imperial Association members. The association's members included Grand Duke Nicholas, the Uncle of Czar Nicholas II, and Artem Boldareff, a wealthy landowner. Unfortunately the Imperial Association that was formed aristocracy became very destructive. Many Borzoi were slaughtered after the Russian Revolution in 1918. The breed, nearing extinction, was saved once again & only because many had been given as gifts to royals in other countries, including Queen Victoria and Alexandra, Princess of Wales and exported to others in other countries who had discovered and were interested in acquiring this breed. The first Borzoi that arrived in the USA was named Elsie. Elsie was originally purchased in the United Kingdom Britain by William Wade from Pennsylvania. Poor Elsie wasn't much to look at apparently, she was small, light, and weedy. Later, circa 1890, another American, named C. Steadman Hanks, visited Russia brought back several Borzoi establishing “Seacroft Kennels”. 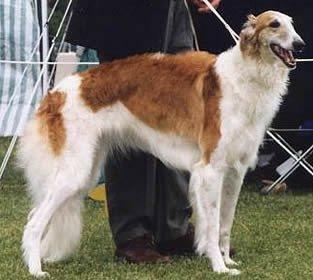 The first Borzoi registered with the American Kennel Club was Princess Irma in 1891. In 1903, Joseph B. Thomas made three trips to Russia specifically to purchase Borzois from the Grand Duke Nicholas’ Perchino Kennels and the Woronzova Kennel of Artem Boldareff. The Borzoi Club of America, then known as the Russian Wolfhound Club of America, was formed in 1903. By1936 the Russian Wolfhound officially changed its name to Borzoi. Today, the standard has been maintained and there is little difference between today’s Borzoi and their ancestors developed in Russia. They remain and elegant, noble standing, poetry in motion, glamorous sighthound that was one of the great treasures of Czars of long ago. •	Elegant, proud and graceful. •	Not a high-energy dog, happy to relax. •	Has a mind of their own, can be stubborn and hard to train. •	Not a good choice for people who have to leave their dog alone for long stretches of time every day. •	As a Sighthound they will chase and kill pets and animals. •	Can be sensitive to drugs due to their lack of body fat. •	Can be fussy eaters and prone to bloat. •	Can be nervous around children and not good with toddlers. •	Not good with other pets. Taking care of your Borzoi will not be as difficult as you think. That is because the Borzoi is a dog that likes to remain clean and healthy. He will do much of his own grooming, which is a good thing for owners! Nevertheless, you do need to pay attention to your Borzoi yourself. They have a long coat that requires a good brushing. Purchase a good quality bristle brush to brush them with and do this at least weekly much more often when able to. Because they do take good care of themselves, for the most part, it is likely that you will be able to bath them very infrequently. You can also use dry shampoos on these dogs when you feel the need to as a wet batch can be hard with a large dog like the Borzoi is. Another important part of caring for your Borzoi is to pay attention to their feet. The hair between their toes needs to be trimmed and they need this taken care of so that they do not have painful feet! Unfortunately, the Borzoi is a heavy shedder which means that brushing them will help to keep the coat off of your home. The Borzoi is a dog that does require play time. They are large animals that often need to be running and playing. In fact, it is necessary to provide this to your dog even when the dog is in a smaller sized area. In order to stay healthy, the Borzoi requires enough room to run. You will need to provide them with some exercise as it is required for their body structure to remain fit. They are mostly muscle under their coat which means exercise to stay fit and healthy. If you can not find the room to allow the pet to run, you may want to consider taking on a new hobby, such as jogging or running. They will love to accompany you on your runs and are often likely to enjoy the bike too. A fenced in yard is the very best area for the dogs but you can also find much enjoyment with taking them to the park. When exercising your Borzoi, you should take note in the fact that they are more than likely to take off in one direction or the other, making them very much dogs that need to be watched in any situation. One of the most difficult things to take in about the Borzoi is just how difficult it can be to train them. You can train them because they are very intelligent animals and they are well known for their talents in the world of hunting. Yet, they are hounds and for that they are often considered to be hard to train for their free spirit and their own mind. Training can be done in a home by the owner or through specialized services. Your goal should be to find a way to get your Borzoi to work with you in terms of training rather than to attempt to discipline them for not interacting with you the way that you want to.